This year, Little Hadham Primary is one of very few schools in United Kingdom to participate in an Erasmus+ project, which is funded by the European Union. 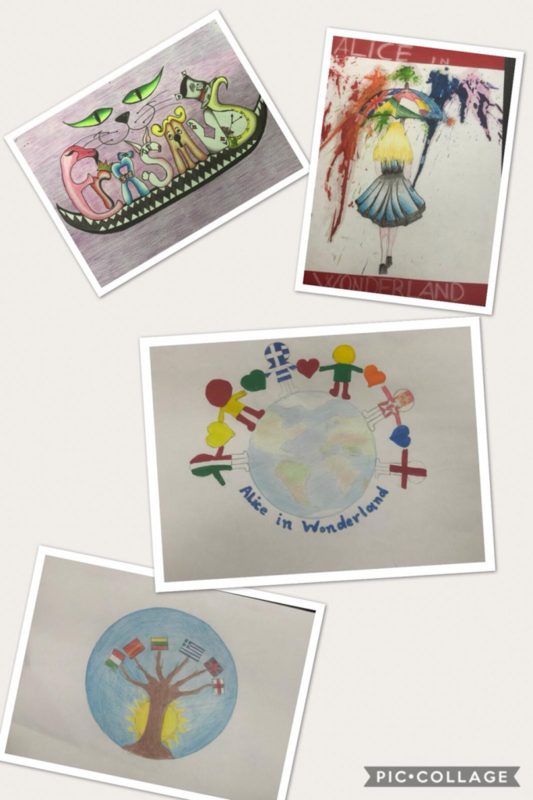 Alice in Wonderland: Discovering our roots, is a two-year project in the framework of ERASMUS Plus Programme, Key Action 229: Cooperation for Innovation and the Exchange of Good Practices. The Project brings together six partner primary schools from five European countries: UK (England and Northern Ireland), Lithuania, Italy, Greece and Spain. Through a variety of stories, the project’s aims are to promote respect for democracy, the rule of law, diversity and solidarity, an understanding of the multiple facets of social integration, inclusion of different cultures in our classrooms, the inclusion of young immigrants and refugees. The main goal is to improve school inclusion by providing not only the young immigrants and refugees but all children with the opportunity to find a place in their new communities through active participation in their school. Inclusion is certainly a wonderful idea. Sadly, it does not happen by itself. Alice in Wonderland is a story that gives pupils opportunities to understand real life issues. It gives children an insight into a world, which they may not have experienced, but it enables them to become citizens with empathy. The activities planned in the project will help children understand the framework based in four thematic topics: Immigration; How together we achieve more; Democracy; European cultural heritage. Children have already created murals of the countries that participate in the project, they have entered the logo competition (the winning logo was from the Greek school) they have seen photos of the other schools and children’s work and watched several videos including children from the other schools singing traditional Christmas carols. Our next activity will be to raise money for Fairtrade. All schools in the project will introduce different actions we can do to raise funds to a charity. A charity or a not-for- profit event will be planned and organised in each partner school. Each school will establish a clear purpose for the event and show how the money raised may contribute changing real lives. In recognition to our international work, Little Hadham Primary School has been awarded with the eTwinning School Label 2019-2020 and this is a great achievement by the eTwinning team in our school! Only 8 schools in UK were awarded this title; eTwinning schools have a high visibility at European Level and form a European network of eTwinning leading schools to inspire the future development of eTwinning. Becoming an eTwinning School provides recognition of the innovative work that our school has implemented in the promotion of citizenship, cultural awareness and digital competence. It also recognises the work we have done to develop a culture of collaboration within and beyond their schools, local communities and countries.